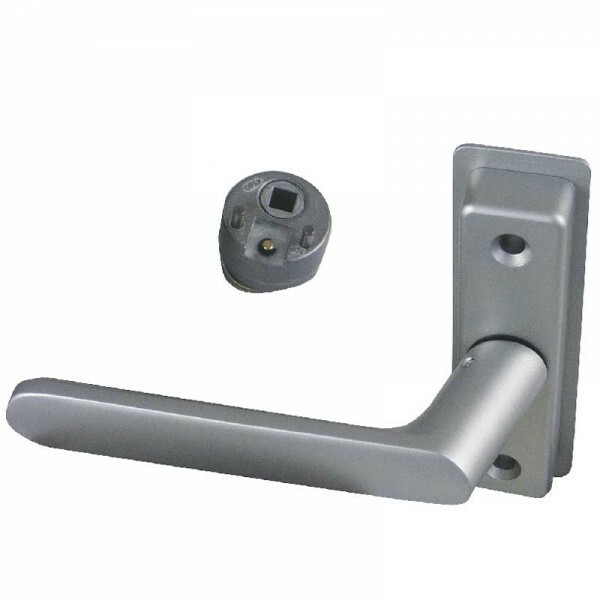 Designed to operate 4700 Series deadlatches by a natural downward hand movement. These handles incorporate an activator cam disc that mounts on the handle escutcheon and fits solidly into the cylinder hole of the latch. Not intended for use as a door pull. The cam plug is secured in latch body by cylinder setscrew, and is also rigidly tied to handle escutcheon by hardened steel pins. The cam plug handing can be reversed by removing a spring clip, "flopping" the cam and replacing the clip. The lever is of cast aluminum with a Satin Aluminum finish. The modern European styling offers a generous hand grip with shank offset away from the narrow stile jamb for hand safety.